Our adolescent residential treatment center for troubled teens is a safe environment where youth can get back on track. At Red Rock Canyon School, our mission is to provide the security, unconditional acceptance, teaching and structure that must be present to ensure that quality treatment can exist. We help teens find the courage necessary to make positive changes in their lives. We build upon their individual strengths, improve their relationships with their families and give them home for the future. Our youth progress through our residential center in a highly supportive and structured environment. Apart from individual and group treatment counseling services, we have programs to ensure adolescent physical, cultural, and social responsibility. 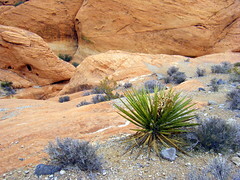 Red Rock Canyon School is a state-licensed treatment facility for adolescents, ages twelve to eighteen, with behavioral and/or emotional problems who require a level of structure and treatment beyond that which is available in traditional outpatient clinics. We offer 24 hour nursing and behavioral management staffing to ensure that our clients have access to professional staffing throughout their stay. Eight Master's level therapists with a combined experience of 150 years. Four Emergency Medical Technicians to ensure safe and competent medical management. In this positive environment, our youth are provided with opportunities to look beyond themselves as they act as positive role models for newer program residents and participate in community service projects. Participation in our enrichment, recreational and vocational training programs further complement their preparation for life challenges and their overall sense of happiness and well-being. We provide opportunities for troubled youth to gain a greater understanding about themselves and knowledge about the world around them. Our student living program offers a highly structured and supportive environment designed to foster acceptance and support in which the youth can practice their newly found skills.